Experience Bali on two wheels, as you escape the hustle and discover the magic of rural Bali, in this full day cycling experience. Off the beaten track but along easy to ride tracks, you will engage with local Balinese villagers, passing local schools, markets and temples. This is Bali in real life, so you can expect to witness the unexpected from weddings to traditional ceremonies, as we cycle at a leisurely pace. Your local guide and driver will pick you up at your hotel, transferring you to our biking start point (transfer around 45mins). On arrival your experienced guide will take you through a safety briefing, provide a safety helmet, and ensure your bike is the the right fit. After a quick safety ride, you will set off with your cycling guide on a 3 hour downhill adventure (times may be slightly longer dependent on weather conditions). 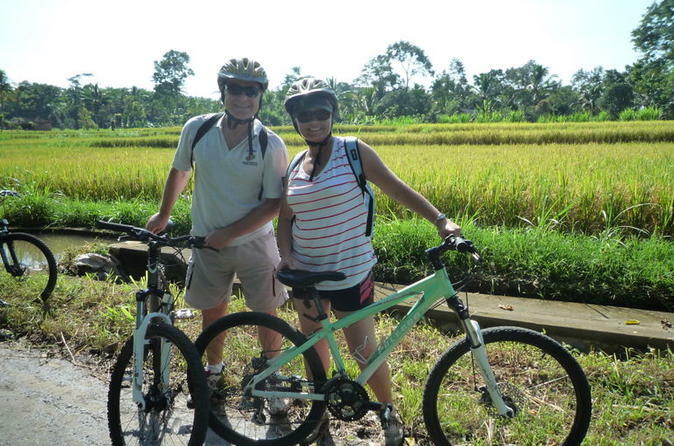 Cycling along secret back roads, though local villages, farms and lush green rice paddies, you will experience rural Balinese life, and witness both the friendliness of Balinese people and any ceremonies or events taking place during your trip. Stopping to sample local fruits and snacks along the way, your local guide will explain local rural Balinese lifestyles, as you drop into a Balinese home. Cycling through lush fruit and coffee farms, we stop at a coffee and spice and herb plantation. Here you will learn the ancient art of using herbs and spices in traditional Balinese medicine, as well as the cultivating the perfect cup of coffee. Bali is famous for its 'Luwak coffee', one of the most expensive coffee beans in the world. We continue to cycle through rural villages stopping to learn how rice is cultivated (you will have the opportunity to try this), stopping at a Balinese style temple, surrounded by colorful offerings. We leave the bikes behind as we take a short walk to Gulingan village, Mengwi. Famous for its Balinese cooking lessons. Here you will learn the art of sumptuous Balinese cooking. Cooking up delicacies such as aromatic satay, banana leaf fish curry, lip watering aromatic rice and sumptuous spice infused vegetables, before sampling your cuisine. Its then time to say goodbye, as you transfer back to your hotel.